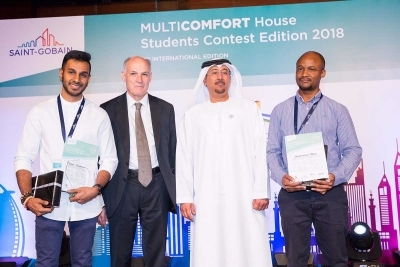 The first prize of the 14th International Saint-Gobain MultiComfort House Students Contest was awarded to Vahin Parmananda and Mthokozisi Sibisi, from the University of KwaZulu-Natal in South Africa. Their project “Solar.Creek.Community” combines innovation and vernacular architecture with a climate driven approach to create sustainable communities. This year, 68 students in southern Africa entered the competition from four different universities - University of Johannesburg (UJ), Tshwane University of Technology, University of Botswana and University of KwaZulu-Natal (UKZN). In total, 34 projects were submitted, and seven shortlisted projects were showcased at the national stage in Johannesburg comprising six projects from the UJ and one from the UKZN. Vahin Parmananda and Mthokozisi Sibisi, from the UKZN, won the southern Africa stage, giving them the opportunity to champion their proposal to an international jury that included representatives from the Dubai municipality, architects and industry experts. Competing against 50 teams from 28 countries, the South African team was awarded the first prize for its project “Solar.Creek.Community”. A feat accomplished in only six weeks, as opposed to the six months given to the northern hemisphere participants. “The reward of getting recognition at this stage is a testament to the hours of work we invested in this project. It is a privilege to demonstrate that the South African architectural community is capable of competing at a global stage,” explain Vahin Parmananda and Mthokozisi Sibisi. Chaired by Pierre-André de Chalendar, Chairman and Chief Executive Officer of the Saint-Gobain Group, and Mr Dawood AbdulRahman Al Hajiri, Director General of Dubai Municipality, the international final was held in Dubai (United Arab Emirate) from 12 – 15 May 2018. “Having won the second prize in 2016 with UJ when we participated in the international stage for the first time was a major highlight for South Africa. To win this year with the UKZN is an enormous achievement and certainly one of the biggest highlights in my Saint-Gobain career,” concludes Sibusiso Mthembu, Saint-Gobain coordinator for the southern Africa stage of the contest. This year, participants had to design a vision for a transcultural vibrant community development located in the perimeter of the cultural village of Dubai. The design had to propose a combination of residential and public spaces to maximize energy-efficiency and wellbeing. The challenge laid in Dubai’s very hot and humid climate. Students had to find a way to reconcile the reduction of energy consumption of cooling and ventilation systems with an aesthetic and highly efficient building envelope without compromising comfort, and while preserving the environment.